all patients. One emerging strategy to reduce costs through better efficiency is the implementation of new healthcare building designs and architecture. One emerging healthcare design trend is the ‘micro-hospital’, a 15,000 to 50,000 square foot facility that offers ambulatory and inpatient care, but with a smaller floorplan and fewer beds than traditional hospitals. These micro-hospitals provide a bridge between current hospitals and clinics, and are designed for patients who do not require the intensive care of a full service hospital but need more care than a traditional clinic can provide. These more adaptive environments require movable EMR charting cabinets and EHR mobile workstations that can quickly and securely be moved into different workflows and floorplans. Most micro-hospitals offer core services including emergency, imaging, pharmacy, and laboratory. These core services are coupled with a main area of concentration such as women’s health, pediatrics or primary care to meet patient needs. The Advisory Board estimates that the construction costs of micro-hospitals are between $7M and $30M, significantly less than the traditional larger, full-service hospital. (https://www.advisory.com/research/Revenue-Cycle-Advancement-Center/at-themargins/2016/05/micro-hospitals) . strength training, acupuncture, and exercise classes such as Pilates and yoga. Staffing micro-hospitals and clinics is also reflecting an emerging trend. Physicians in solo practices (18%) continue to decline, as more than 58% of physicians are employed by a hospital or group. https://www.statista.com/statistics/397863/doctors-portrait-in-the-us/Micro-hospitals and clinics are employing physicians to serve patient populations and communities and also employing allied health practitioners and support staff to work with physicians in a team environment rather than a medical office setting. 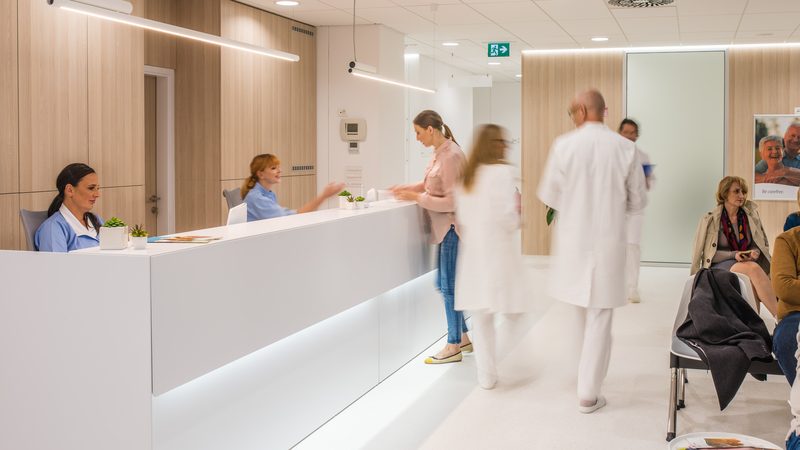 In both micro-hospitals and clinics, the newly designed floor plans have shifted from stand-alone exam rooms to spaces that convert to rooms for consultations and multi-purpose rooms that change function depending upon patient needs and scheduling. These modular systems also support group treatment settings such as dialysis or chemotherapy. Some of these floor plans offer community health education programs such as CPR, first aid or Lamaze classes. To support these new designs, administrators need to consider how to staff and build the supporting areas within these multi-purpose settings. Current floorplans often have wings of exam rooms, separate areas that serve as staff offices, centralized areas for storage and supplies, and a medical record room that often has a method to secure access. Building or modifying micro-hospital or clinic floorplans may require physicians to share office or work spaces with support and administrative staff. Centralized storage and supplies need to be repositioned within or close to patient care areas to avoid delays. Paper or electronic medical records need to be quickly available, but also need to be secured to prevent HIPAA or other privacy and security regulatory requirement infractions. Traditional wall mounted cabinets, storage units, supply containers and medical records file rooms need to be reimagined with innovative designs that have the flexibility to support versatile healthcare environments. Hospital or clinic workspaces with individual wall mounted computer monitors, medical equipment and other technology contained in an exam room is not a cost effective solution, as the equipment may not be utilized on a consistent basis and cannot be quickly and easily transported when needed. Mobile cart technology offers the efficient and streamlined functionality that micro-hospitals and clinics require. As rooms are repurposed for diverse needs, mobile carts can be quickly and easily deployed, plus they offer the durability that constant use requires. Many mobile carts provide secure key-lock storage of multi-sized medical charts to ensure HIPAA and other regulatory security and privacy compliance, essential in open areas where multiple patients and staff may have unintended access. 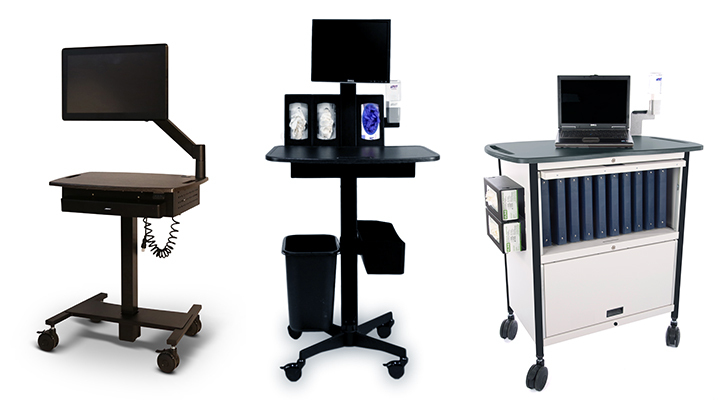 For areas that don’t require security, there are cost-effective mobile carts that are easily transported between exam and treatment areas with additional storage for supplies to reduce the need to access a centralized supply area. 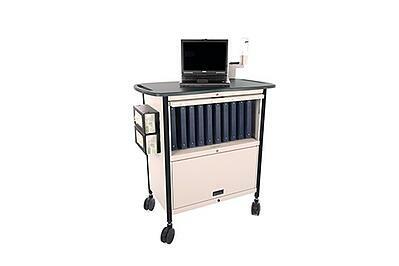 For clinics and micro-hospitals who need additional work space, there are mobile carts that can accommodate a laptop, tablet or other technology, giving care-givers fingertip access to critical information as well as reducing the time consuming and higher cost of retrieving and re-filing paper medical records. cleaned and disinfected between patient visits is critical. Mobile carts that include an antimicrobial powder coating surface area offers another layer of additional support to clinic settings or microhospitals with unique infection control needs. reduce costs, increase efficiency and provide neighborhood access to quality care. As US healthcare moves to more flexible environments, equipment that support diverse environments will be essential. Innovative design will need to be carefully considered, and extend beyond the floor plan to select furnishings and mobile carts that offer flexibility, durability, and portability.